Pondera South East Asia will be organizing the WindDays in Indonesia on 7 and 8 October 2019. Indonesia, the largest economy in Southeast Asia, has an attractive demographics and strong demand for energy. With one large, recently opened wind farm in Sulawesi of 75 MW, Indonesia is just at the beginning towards a more sustainable future. The countries’potential for wind energy is high. It has been calculated to have a total potential for onshore wind energy of 9.3 GW. The Indonesian government is aiming for 1.8 GW of installed wind capacity by 2025. Do you want to be a pioneer in this development? If yes, the WindDays South East Asia will provide an excellent opportunity to explore this market and to take the first steps. 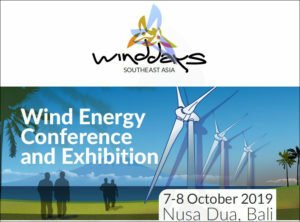 View the leaflet of the WindDays here or visit the website of the WindDays South East Asia.